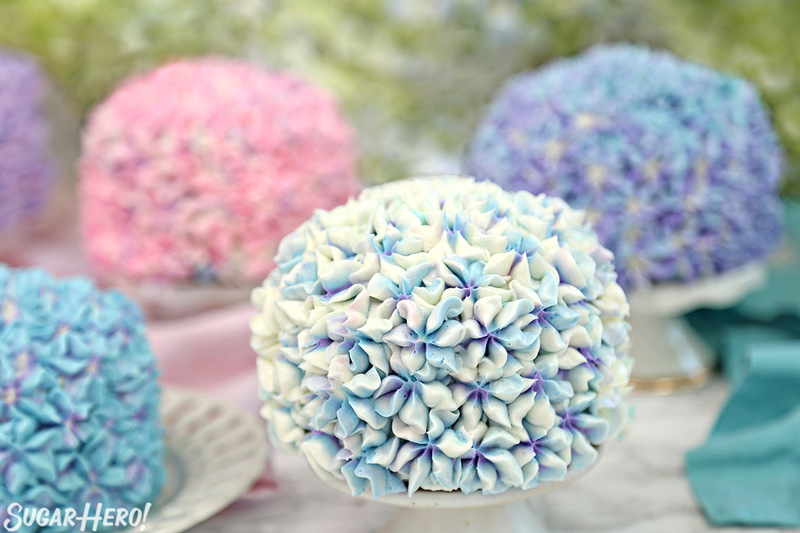 These Hydrangea Cakes are gorgeous miniature cakes that look like hydrangea flowers! 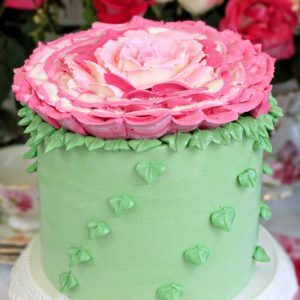 You’ll be surprised to learn how easy it is to make the pretty, colorful blossom design on the outside. The inside is beautiful, too, with swirls of multicolored cake! All of that is to say, I have several “springy” projects I’ve already made—and a few more I’m planning on—and I have to hustle to share them before it’s old news and we’re all watermelon and pool party obsessed! 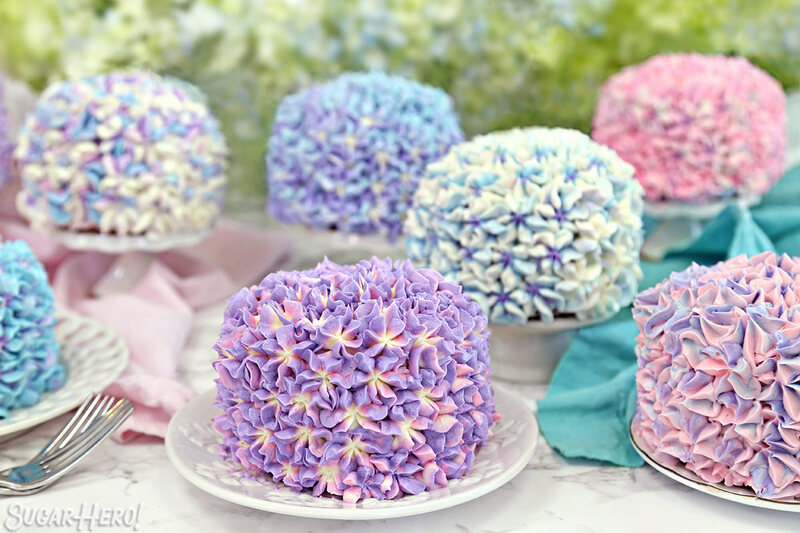 Honestly, though, even if I shared these in the dead of winter, I still think these hydrangea cakes would be appropriate. They’re too pretty, too eye-catching, too happy-making (yeah, that’s a thing I just made up) to go out of style. If you follow me on Facebook, these might look familiar to you. I shared them in a Facebook Live broadcast the week before Mother’s Day, as a not-so-subtle hint to make Mom something tasty and beautiful on her day. So if the short how-to video at the top of this post leaves you wanting more—more instruction, more piping examples, more of my sparkling wit and personality—you can watch the replay of the Facebook Live video here. We do these every Sunday, so I hope you’ll join me for one sometime! And sign up for the mailing list so you get notified of when they’re happening and what projects we’re doing. END SHILL. BACK TO THE CAKES. They’re freaking adorable. Okay, maybe you already knew that. They’re made with a velvety white cake batter. 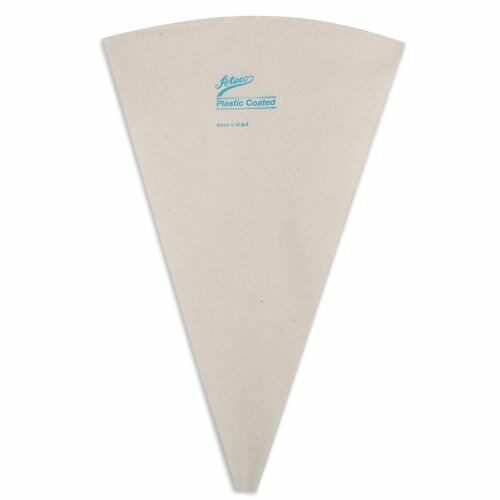 It’s super soft and tender, with the most delicate crumb and a soft vanilla flavor. You can use other extracts if you like, though. I think a touch of rose water would be delicious! It was impossible to stop taking pictures of them. Seriously! Isn’t that interior view lovely? I had so much fun mixing up both the inside and outside colors. You don’t have to go whole hog and do the cake batter swirls, but as long as you’re getting the food coloring out, why not, eh? I hope you’ll give these a try, and if you do, I hope you’ll share a picture too. Now get out there and enjoy the rest of spring before summer hits! Lightly whisk together the egg whites together with a quarter of the milk and the vanilla extract, and set aside for now. Add the remaining ¾ cup milk and the softened butter to the large mixing bowl and mix on low speed until the dry ingredients are moistened. Turn the mixer to medium speed and mix for a minute and a half. Add the egg white mixture in three batches, mixing for 20-30 seconds after each addition, until you have a smooth batter. Scrape the bottom and sides of the bowl with a rubber spatula, and give the batter a few more stirs to make sure everything is incorporated. 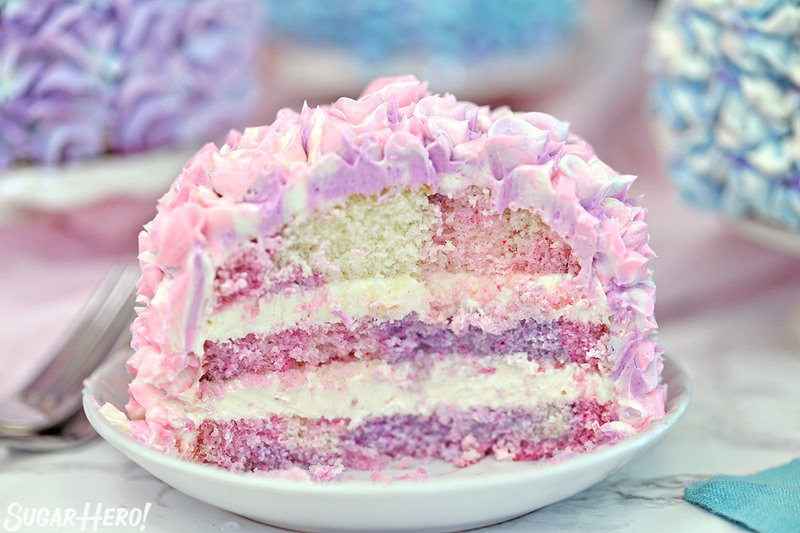 Divide the batter into 4 even portions, and color one purple, one blue, and one pink. Leave one portion white. Use a spoon to scoop spoonfuls of the batters and plop them in a random pattern in the prepared cake pans. Fill them about halfway full—each pan should have about 7 oz of batter. Bake the cakes at 350 F for 30-35 minutes, until the sides just start pulling away from the pan, and a toothpick inserted into the center comes out clean. 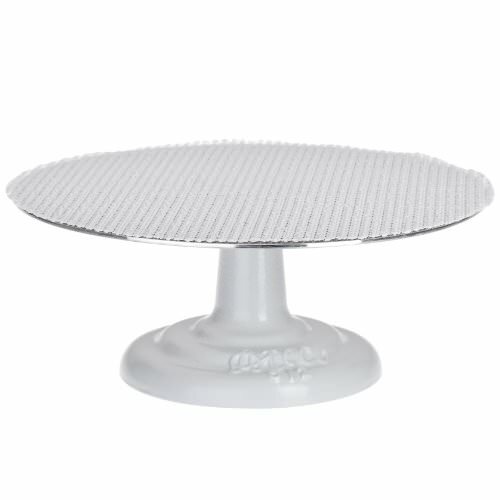 Place the cakes on small cake cardboard rounds, and set one on a cake turntable. Use a sharp serrated knife to cut it into 3 layers. Spread a layer of white buttercream between each layer, and cover the top and sides with a thin layer of frosting. Repeat with the other cakes, so they are all layered and covered with a thin coat of frosting. Divide the remaining buttercream into smaller bowls. Leave some white, and color the rest different shades of blue, purple, and pink. You can do as many colors as you want, but I like to do at least 4-5 to give all the cakes a different look. 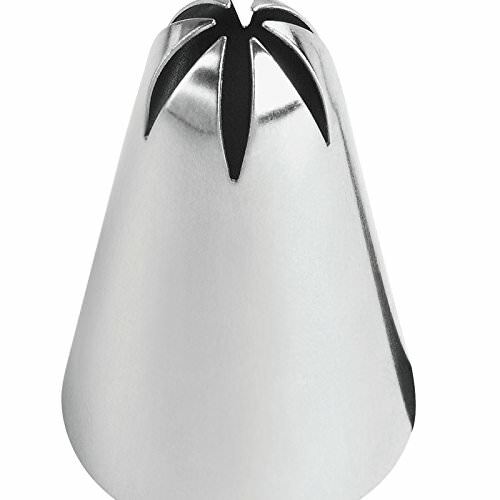 Fit a piping bag with a large star tip – I like to use a Wilton 2D, but a 1M would also work. To make multi-colored flowers, lay out a piece of plastic wrap about 16 inches long. Spread a rectangle of frosting on the plastic wrap, about 10 inches by 6 inches. 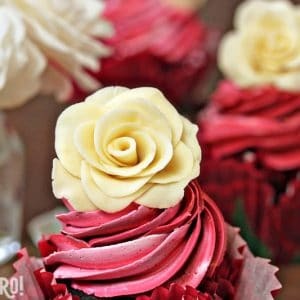 Take a second color of frosting and spread it on top of the first. If desired, add a third or even a fourth color on top. Roll the frosting over itself to make a cylinder. Grasp the ends of the plastic wrap in each hand, and twirl it quickly so the frosting is burrito-shaped and the ends of the plastic are tightly twisted. Snip off one of the plastic wrap “tails” and insert the frosting cylinder into the piping bag, snipped-side down. Repeat until all of the cakes are decorated. For the best taste and texture, serve them at room temperature. For the cake, you may use egg whites that you’ve separated, or use pasteurized 100% egg whites from a carton. For the buttercream, since the egg whites are not cooked, pasteurized whites from a carton are necessary for food safety reasons. The cake recipe is adapted from a white cake in Rose Levy Beranbaum’s The Cake Bible. (An excellent book that I highly recommend!) The frosting recipe is my Easiest Swiss Meringue, adapted from a recipe by Lauren Kitchens. I just want to make one for a smash cake?… what would a measurement be for this recipe? Please:) these are beautiful!! 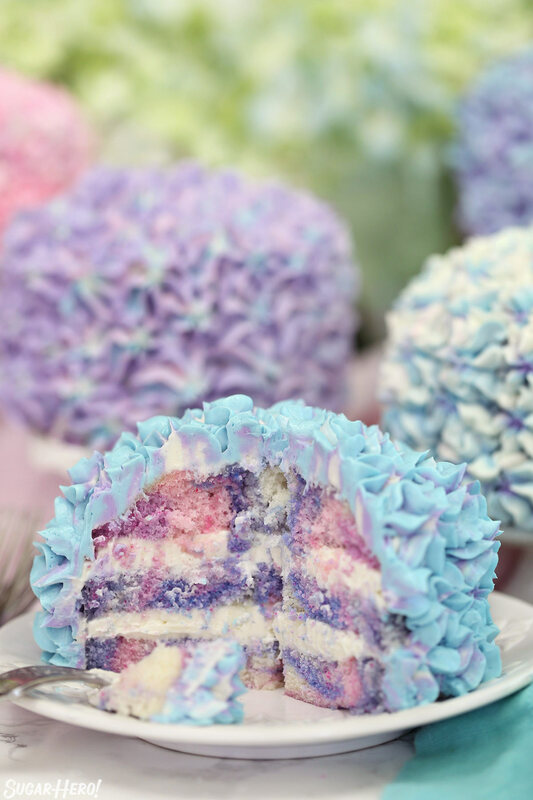 These are absolutely adorable, I love the pastel marbled cake. May I ask where the finished cake plateau is from? Thanks for sharing. A cup of powdered sugar is 4 oz, so 24 oz is 6 cups. 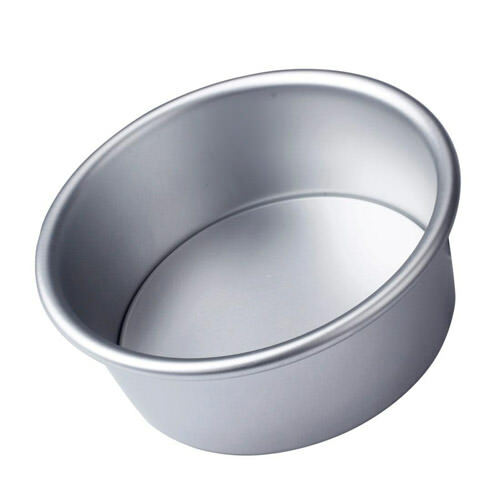 (Cups are a volume measurement and do not have a standard weight–different ingredients have different densities and thus weigh different amounts.) This recipe makes over 8 cups of buttercream, so yes, it requires a lot of sugar. If you only use 3.5 cups the texture of the frosting will probably be affected. I tried the frosting last week and it turned out extremely runny, unusable. Any suggestions? Hi Joanie, I’m happy to help you troubleshoot, but a few more details might be helpful–please email me and I can take you through it! In general, the frosting goes through a runny, broken phase before it comes together, so my advice is almost always to keep beating it longer until it emulsifies and thickens. The time suggestions are general guidelines, but it may take you more than 10 minutes of beating to get the texture right. Yes, it makes super cute cupcakes! The frosting is a variation of swiss buttercream? Do you mix egg white until peaks or no? Nope, not with this recipe! It’s a similar taste and texture to SMBC but a totally different preparation method. I made one with two 8 inch cakes. Kind of big, but still pretty. Just got done with this recipe and I love it! That frosting is AWESOME!! 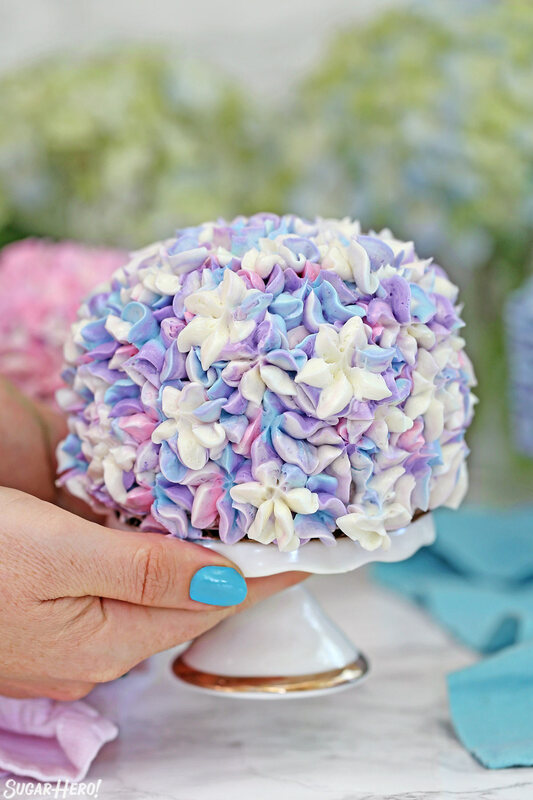 I made these mini hydrangea cakes for my Mom’s 71st birthday dinner that is here in just an hour. I think she will be thrilled with them. They turned out so cute! Do you think whipped frosting would hold up after putting it into the plastic wrap and then the piping bag? Have you ever made this Gluten Free? Having celiac I always have to convert! Is there a video of this cake making process? I didn’t see a link. It says 24 oz of butter in frosting, how much is that in cups? Sounds like a lot?? 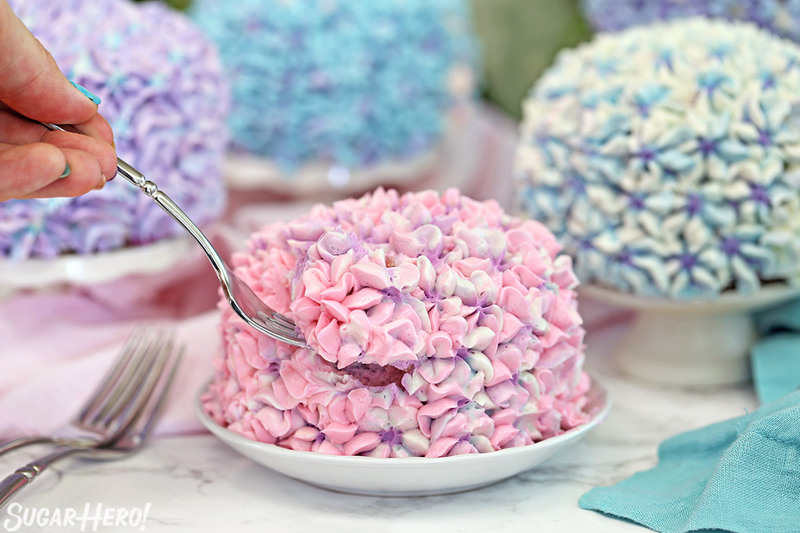 Can I premake the the whole cake and freeze them with the butter cream on them and keep them for a few days? I typically freeze the components separately and then assemble at a later date–I just think that provides the freshest taste after the freezer. If you need to freeze them fully assembled, you can do it, although I would say that’s the less optimal choice. I would recommend freezing it briefly, until the buttercream is solid, and then wrap it very well in plastic wrap and keep it in an airtight container. Then when you’re ready to defrost it, unwrap it while frozen so the buttercream decorations don’t get smushed by the plastic wrap when they soften. I also wouldn’t keep it in the freezer for months, but it should be okay for a few weeks. Great thank you! Yes freezing the frosting ia a good idea. I just wanted to do it for a day cause tomorrow is mothers day. And I will need to wake up early to assemble them ..I am so excited to see my mother’s face when I make it for her.thank you so much for sharing. Making them as we speak!!!! Hope they turned out well. Thank you! I just made these in a practice run, one 4” and a dozen cupcakes. They’re beautiful! However, the frosting is a little ~buttery~ for my taste. Can you suggest the best way to modify the recipe (more sugar, less butter) for a sweeter taste without too much a negative impact on consistency? Thank you! You can experiment with taking down the amount of butter but only reduce it in small increments because it will adversely affect the consistency if you remove too much. We made these beautiful cakes for my mother’s 90th birthday party. They were nearly a bigger hit than she was. I made vanilla cakes with raspberry center filling and they were delicious. 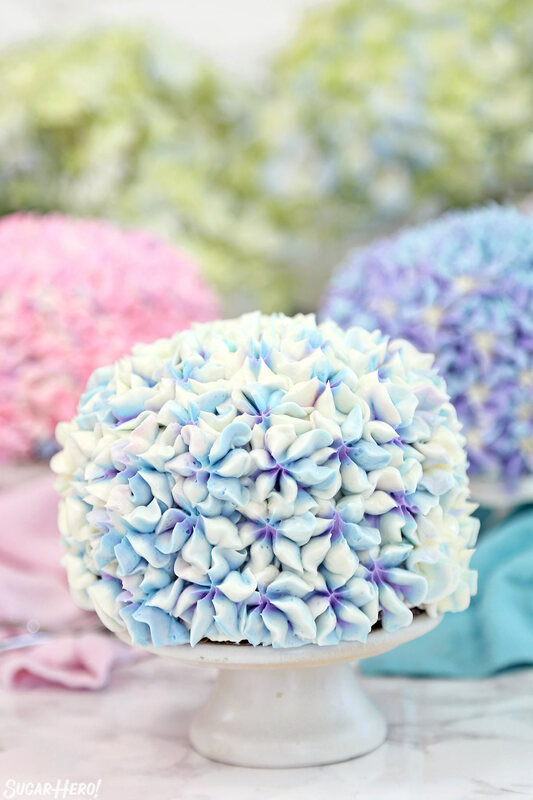 She has hydrangeas in her flower bed and so the cakes were perfect. Thank you for the how-to-do video for doing the ‘petals’. This made it a ‘piece of cake’! What is the substitute for pasteurised egg whites . Also what would the measurements be to make one 4 inch cake ? Can I use condensed milk buttercream? Hi I made this cake and it came out amazing!! My only issue was that my cake didn’t rise as much as yours. I put all the correct amounts and I tried not to fold too much air into the mixture – but to no avail. Any advice? Hi Michel, 24 oz is a weight measurement, not a volume measurement. (6 cups is the volume measurement). Each cup of powdered sugar is 4 oz on a scale, so 6 cups is 24 oz for those who prefer to bake by weight. I always include the cup measurement for those who don’t have a scale. Hope this helps! I made these cakes with my sister, myself, and my nephew’s wife. The frosting was the best part. I have NEVER tasted such smooth frosting that didn’t rot the teeth out of your mouth. I would like to post a picture, but there isn’t a place on your blog here to do so. We got lots of comments on them when I posted on FB. Hey! I seem to be doing something wrong but I’m not quite sure what, my cake batter keeps turning out grainy looking. It seems to occur after the second addition of the egg white and milk mixture. What am I doing wrong? Hi, have you got any photos of what the icing burrito looks like? I’m a bit confused by the instructions. Hi Nicol! You can see the process of making the icing burrito (haha) in the video that goes along with the post. Beautiful flowers,beautiful work. 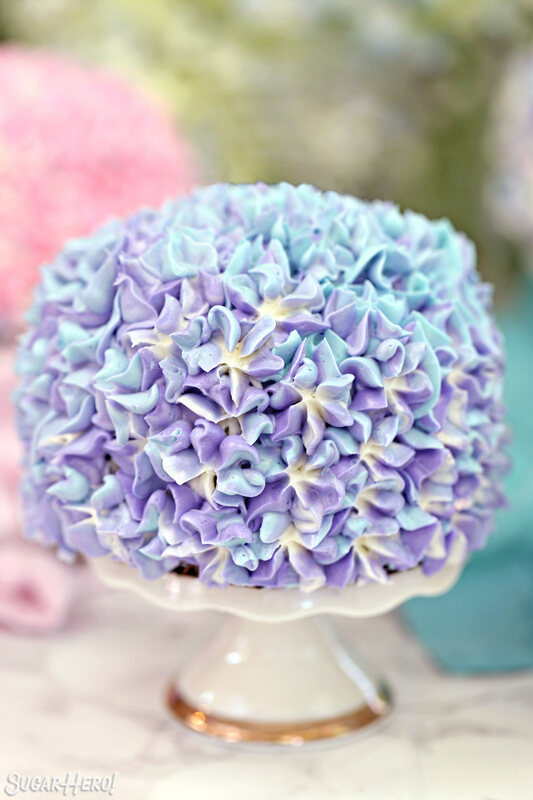 I always love to use flowers in decorating my cakes and now hardanger flowers will be on top of my list. Thank you. Hey, Thank you! So glad to hear it! I would love to hear how it goes! Thanks so much! Hi Ms. Elizabeth, I’d love to bake this cake, but my problen is your buttercream frosting, do you thing it will stay in shape in a hot weather? If not, do you have any recommendation? Your help is greatly appreciated. Thank you so much. Hi Tes, the buttercream is definitely better in a cooler temperatures. One thing you can do to help maintain the structure is to swap half the butter for shortening, you will be sacrificing some of the flavor. It might be a good trade off if you want to make it work though. I would try and keep it chilled anytime you can and definitely keep it out of direct sunlight. I hope that helps! Good luck.